Regarding the Finance Minister’s speech about the impact of the UK referendum on the market volatility, GBP got weakened against the USD. However, Osborne claimed that the UK is ready to leave EUR and face the consequences. After the referendum the pair fell down and it has been moving in lower ranges since then. 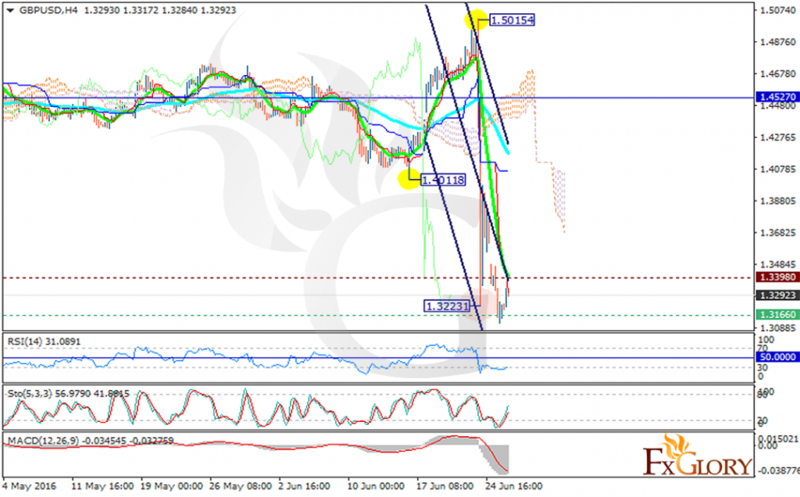 The support rests at 1.31660 with resistance at 1.33980 which both lines are below the monthly pivot point at 1.45270. The EMA of 10 is falling sharply below the EMA of 75 indicating the current sudden price decline. The price is under the Ichimoku Cloud and it is under the Chinkou Span. The Tenkan-sen shows a downward movement and the Kijun-sen shows a horizontal movement. The RSI is moving horizontally in the oversold area, the MACD indicator is in negative territory and the Stochastic is showing upward momentum. GBPUSD will start its correction pattern soon and will rise however at the moment further decline is expected targeting 1.3100.